DescriptionKyle Busch won the ISM Connect 300 on Sunday. Fans were also treated to driver appearances and a pre-race concert by Dan + Shay. 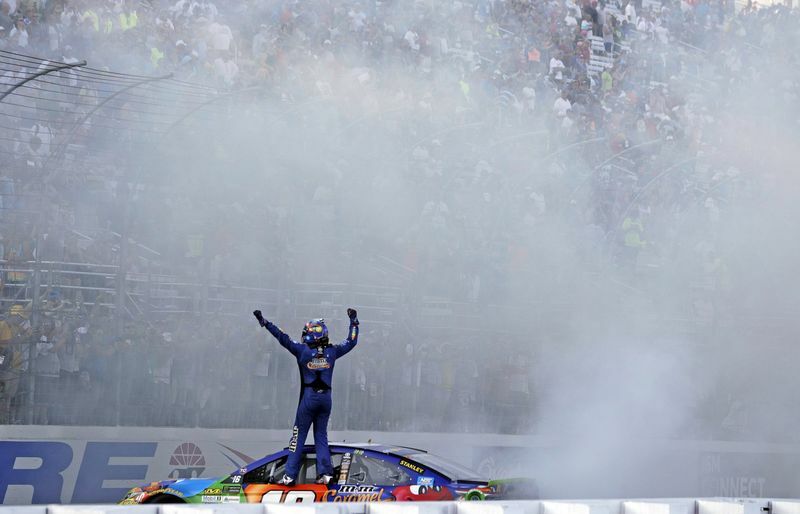 Already the all-time leader in NASCAR national series wins at New Hampshire Motor Speedway, Kyle Busch extended that winning trend on Sunday in the ISM Connect 300. The 2015 Monster Energy NASCAR Cup Series champion put himself in good position to pick up his second championship in two years after a dominant win - the 12th of his career at NHMS - that punches his ticket to the next round of the playoffs. Busch led 187 of 300 laps on Sunday, the vast majority of those coming in the 150-lap Final Stage, having narrowly avoided a big wreck that collected five playoff cars at the end of Stage 2. It was also a bit of redemption after a gaffe on pit road last week in Chicagoland cost Busch a chance to win the playoff opener. "Getting through that smoke was the defining moment of the race for sure. And we've got a good pit crew and they did everything right today - today was a good catch-up moment for us," said Busch, who now has three Cup Series wins at NHMS to go along with three wins in the XFINITY Series and six in the Camping World Truck Series. "This place always has exciting races and exciting moments, so I always look forward to racing here." The runner-up spot went to Kyle Larson, while Matt Kenseth, Brad Keselowski and Martin Truex Jr. rounded out a top-five consisting of all playoff contenders. It was the second straight runner-up finish for Larson at NHMS, the third of his career here, and his seventh of the season. "Obviously, you want to win because second is just the first loser, but especially when you get to the playoffs. Winning is important, but consistency is just as important and top-fives will get us to Homestead," said Larson, who is 81 points clear of the elimination line and will advance to the next round no matter where he finishes next week at Dover. "Normally I'm struggling on short tracks, but today it was pretty good, especially on the long runs." It was the fifth straight top-five finish at NHMS for Kenseth. The three-time Granite State winner started the day in 10th and moved up through the field to finish third, but never really had enough to challenge his Joe Gibbs Racing Toyota teammate for the win. "We were decent, I just really struggled getting through the gears and into Turns 1 and 2 all day. I thought we had a third-place car all day," said Kenseth, who moves up from ninth to sixth in the standings. "If you can't win, you want to finish as high as you can, but we really need a win." Spots 6-8 went to non-playoff pilots Erik Jones, Clint Bowyer and Daniel Suarez, respectively. Playoff contender Ryan Blaney finished ninth and New England native Joey Logano, who missed the playoffs and started the race in 36th, finished 10th. Other notable playoff contender finishes include Chase Elliott (11th), Denny Hamlin (12th), Ryan Newman (13th), Jimmie Johnson (14th), Ricky Stenhouse Jr. (15th), Jamie McMurray (16th), Austin Dillon (19th), Kasey Kahne (35th), Kevin Harvick (36th) and Kurt Busch (37th). Stage 1 Winner - Martin Truex Jr. The opening stage went to the points leader, who followed up his win in the playoff opener last week by leading the final 36 laps of Stage 1 after overtaking the lead from pole-sitter Kyle Busch on Lap 40. Larson also got by Kyle Busch (third) late in the opening stage to finish second, while Jones finished fourth. The remaining drivers in the top-10 were all playoff contenders: Blaney, Kenseth, Keselowski, Johnson, Hamlin and Harvick. Truex looked well on his way to a win in the second stage, too. But with a half-lap remaining, Harvick went sliding out of Turn 2 after an apparent run-in with Dillon, causing a massive smoke cloud that also caught up Truex, who was leading and trying to work his way through lapped traffic. Kurt Busch, Dillon and Hamlin were also gathered up in the mess, but it was Kurt Busch and Harvick who got the worst of it, as the wreck ended both their afternoons. The wreck benefited Kyle Busch, who slipped between Harvick's back bumper and the outer wall, and into the lead as the caution flag waved. "That was pretty intense," said Busch. "It was just a wall of smoke over there and I just checked up and somehow got through it." Kenseth, Larson and Keselowski finished second, third and fourth, respectively, while Truex, Hamlin, Johnson, Blaney and McMurray finished sixth through 10th. Jones (fifth) was the lone non-playoff driver to earn Stage 2 points. Harvick's DNF was the first of his career at NHMS. Richard Rawlings, the successful entrepreneur and eclectic star of Discovery Channel's hit TV show "Fast N' Loud," served as the honorary pace car driver for the ISM Connect 300. The race took 2 hours, 54 minutes and 47 seconds. A total three different drivers led the ISM Connect 300. Dale Earnhardt Jr. finished 34th in his final race at NHMS. Before the race, New Hampshire Senator Jeanne Shaheen announced Sunday, Sept. 24, 2017 at "Dale Earnhardt Jr. Day" in New Hampshire.